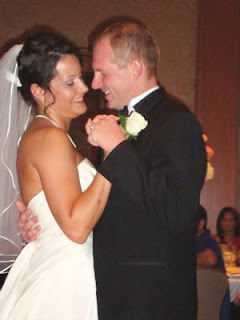 It was another beautiful day at The Umstead Hotel and Spa and so perfect for Christina and Chad’s very special wedding. They are such a great couple and it is obvious they are going to have a happy life together. Everyone was talking about what a perfect fit they are for each other and I heartily agree. They have been living their lives in separate states for quite a while and it is going to be so nice for them to be together at last. 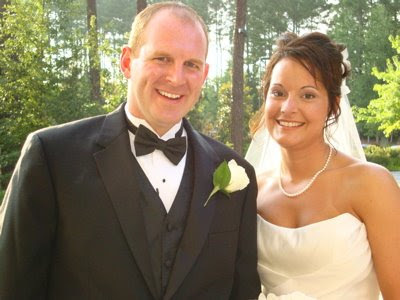 After the honeymoon they plan to reside in Iowa, where Chad is part of his family’s business. Ami Wheeler, the Social Catering Manager for the hotel, made sure all was perfect for them in the beautiful wedding garden where the ceremony took place and the elegant Salon Room where the reception was held. 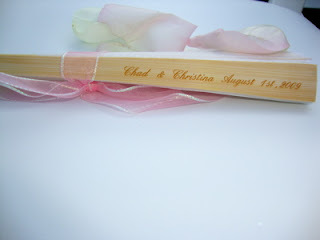 Christina and Chad provided these engraved fans for their guests during the ceremony. This very thoughtful idea provided some much-needed respite against the summer heat and humidity and the engraving on the fans was an elegant touch. 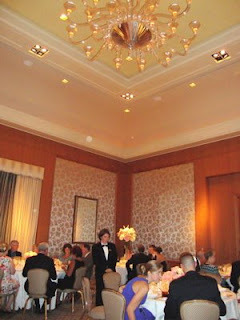 The reception was held in the Salon Room where everything was exquisitely presented and the food was delicious. 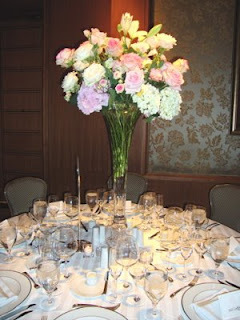 All the flowers for the wedding and reception were provided by Steven Taras of The Watered Garden, who is one of the florists the hotel uses for its own floral displays. He is quite an artist and his handiwork was beautifully displayed everywhere. I wish my photo did them the justice they deserve. Over by the cake was a beautiful, intriguing goblet that looked like a woman carrying a bucket above her head. It is called a Nuernberg Wedding Cup and was a wedding gift to Christina and Chad from a friend who had traveled in Germany. According to the German story (said to be true), in 1450 there was a young goldsmith who shared a love with a wealthy man’s daughter. The father, most disapproving of this affection, had the young man thrown into prison. After seeing his daughter wither away from her grief, he told her that if the young man could make a chalice from which two people could drink at the same time without spilling a drop, he would free him and allow them to marry. He was certain, of course, that this was an impossibility. But true love is a marvelous motivator and the young man rose to the challenge, cleverly creating two goblets in one. The larger goblet is the woman’s skirt and the bucket she carries is the smaller one. The bucket is ingeniously designed to swivel at her hands, which then allows the bride and groom to drink at the same time. The father had no choice but to allow the couple to marry. (Ingenious young man!) You can find the full story of this charming legend here. How can we ever resist the look of love on the faces of the bride and groom as they dance their first dance as husband and wife. 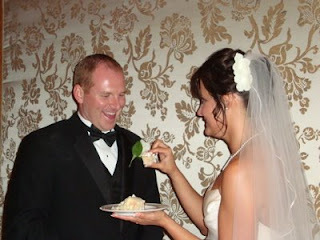 Or the gleam in their eyes as they decide if they should be nice as they feed the cake... or not. 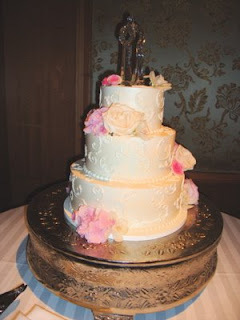 Speaking of the cake, this beautiful creation was provided by Donna Ford of Sweet Memories. I have seen many of her cakes before and they are always exquisite. Her cakes are works of art and she has provided cakes for national and international celebrities. Obviously her talents are renowned. Their photographer for the event was Chris Perez of Azul Photography. Chris’ work is amazing! He has won many photographic awards in his career and the photos on his website and blog show abundantly why this is so. To say they are excellent photos is an understatement so I can’t wait to see his photos from Christina and Chad’s wedding! 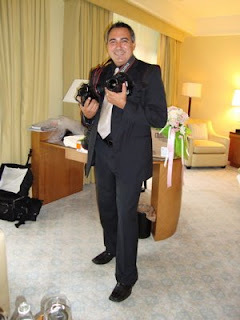 The DJ for the reception was Kevin Majoros of Joe Bunn DJ Company. Kevin was a great DJ with an amazing playlist and all of us at our table were constantly talking about how good all the songs were. He also had two slim, cylindrical speakers that put out some high quality sound. Very impressive technology. And lest I forget, the woman whose job is a necessity and who did such a great job on all the hair and make-up (which was no small feat in the heat and humidity) was Page Berse of About Face Make-up Artistry. 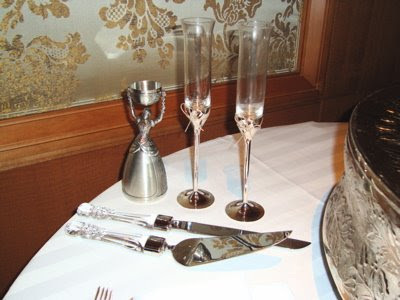 The legend of the Wedding Cup states that love, faithfulness and good luck await the couple who drink from this cup... I see a wonderful marriage ahead for Christina and Chad.